Attracting bees to your garden is easy to do with the right plants and environment. 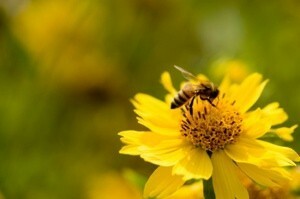 This is a guide about attracting bees to your garden. Without pollinators, many of the fruits and vegetables we plant in our gardens would be impossible to produce. Scientists around the world are telling us that pollinators are currently in a serious state of decline due to loss of habitat, pesticide use, and disease. As gardeners, we can help. Here are some things you can do to create a pollinator-friendly garden. We know that pollinators are important to our backyard gardens, but what about their importance worldwide? Consider that nearly 90% of the world's flowering plants depend on animal and insect pollinators. And according to the Pollinator Partnership, as many as 80% of the world's crops depend on pollination for fertilization. Many of the food, beverages, textile fibers, spices, and medicines we make from plants could not exist without the help of pollinators. Plant native plants: Native pollinators rely heavily on native plants for food. Will they visit and pollinate cultivated plants? Usually. But many non-native flowering plants, shrubs, and trees are bred to have big showy blooms at the expense of producing large amounts of pollen. Also, native pollinators don't always recognize the food value of cultivated plants, because they don't have an established history with them. Besides providing nectar and pollen-producing flowers, native plants also act as hosts for insect larva, and provide seeds for native birds. Look in your local yellow pages or contact your county extension agency to find nurseries in your area that sell native plants. Focus on diversity: Different flowers attract different pollinators. For example, some flowers have stripes or color variations on their petals that act like a landing strip and guide pollinators toward their nectar. Others have shapes that accommodate long beaks, or flower only at night. Different pollinators are equipped with different tools for collecting and transporting pollen, so growing a diverse group of plants--plants with different shapes, colors, sizes, fragrances, and flowering times-will attract the greatest number of native pollinators. Provide water and shelter: Like all animals, pollinators need access to fresh water and places to feed and raise their young. Use a birdbath or shallow pool containing rocks to provide pollinators with fresh water. A quick Internet search will provide you with free plans for bird houses, bat houses, and nesting bungalows for native bees. Let a corner of the yard go to native grasses, weeds, and wildflowers to provide shelter for pollinating insects like ants, moths, and beetles, and a patch of bare sandy soil to accommodate underground bees. Locate these sites away from patio areas and places where children frequently play. Avoid using chemicals: Pesticides and herbicides are a pollinator's worst enemy (and harmful to other beneficial insects as well). Garden organically and consider an integrated pest management system to control pests. If you do use pesticides, please apply them when they will be the least disruptive to pollinators (usually after dusk for insect pollinators). Know your garden pollinators: It's important to know who your garden pollinators are so you can plant the type or flowers that attract them. The USDA Forest Service has a wonderful resource describing the types of characteristics a flower must have to attract a specific pollinator; the color, shape, fragrance, etc. Visit their Pollinator Syndromes page for more information. If you must use pesticides, do so in the late evening when most bees have finished collecting nectar and pollen for the day. Try to use pesticides that are safe to bees. 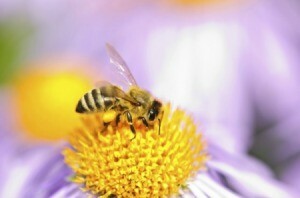 Bees pollinate fruits and veggies. If you have no bees, then you'll have no fresh fruits and veggies. Make your property bee-friendly. Bees like these plants: calendula, shasta daisy, coneflower, vetch, geraniums, catnip, oregano, rosemary, lilac, mock orange, crabapple, wisteria, snapdragon, just to name a few. Providing bee habitats in your yard or garden can increase the quality and output of your vegetable garden and or fruit trees. They are especially fond of blue and yellow flowers. Likewise they are fond of blue and yellow clothing, yard art, and flags. I heard that I could find the above on your website. How do I do that? 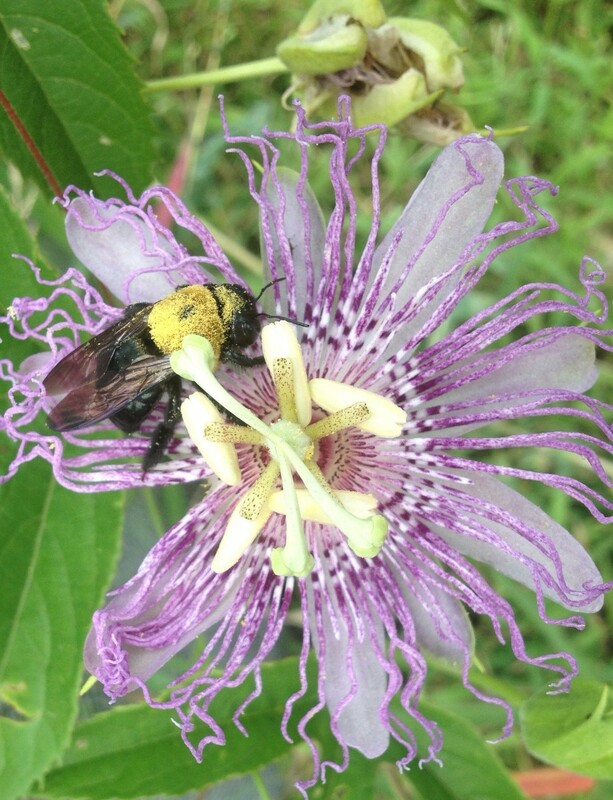 The beautiful passion flower is our Tennessee State Wildflower. We let it grow wild on our homestead in our garden to encourage the bees to come pollinate our plants. I harvest the leaves of the passion flower to make extract which helps promote restful sleep. This appears to be a very happy bee, nestling into an abundance of its favorite food. It was so intent on what it was doing, it didn't seem to notice the presence of me or the camera. 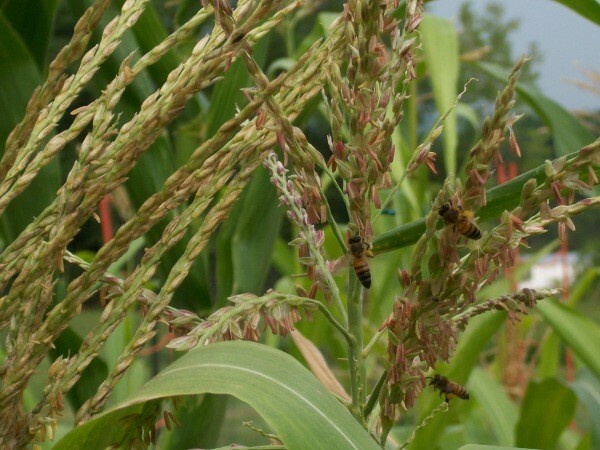 Early in the morning when I was out picking in the garden, I heard a lot of buzzing going on in the corn. I decided to see who was so busy. 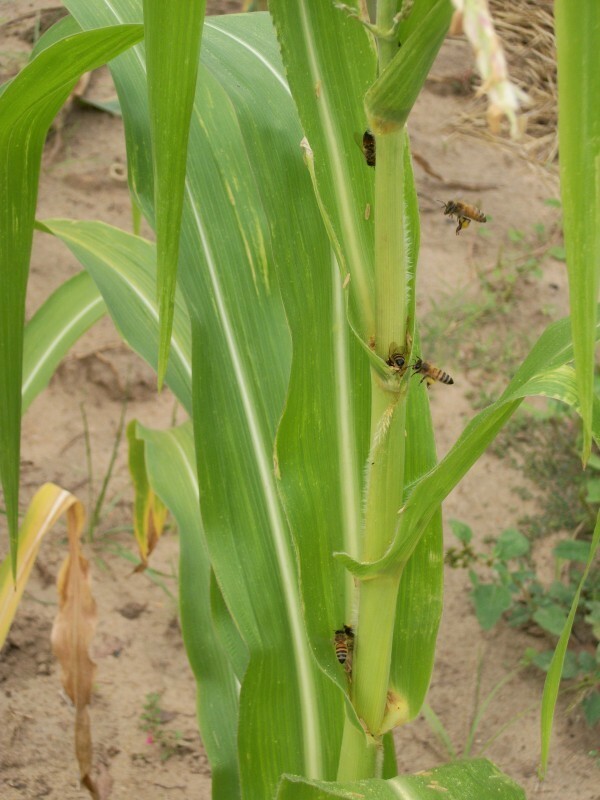 I noticed not only bumble bees, but also honey bees working hard on pollinating our corn. I had to go get my camera to capture these bees hard at work! Usually we only have bumble bees, so seeing so many honey bees was very exciting for me.